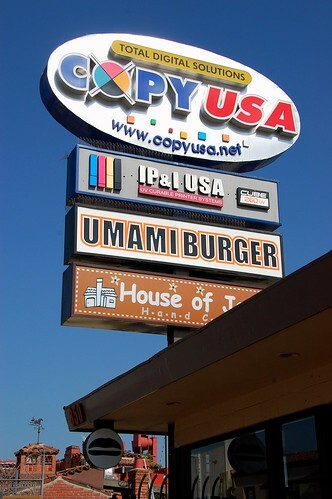 When the Cruisers suggested that we go to Umami Burger together, we were excited. When the Cruisers suggested that we order six burgers to share, we were ecstatic. The Cruisers are full of good ideas. 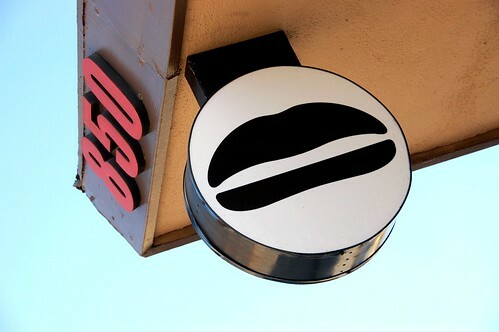 We've since decided that we're going to do a Los Angeles Burger Quest, and this retroactively became our first stop. 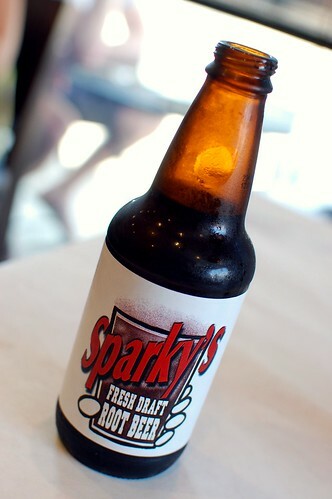 Mr. Monkey got this root beer. I had a sip. My sip had a bite. This was a good thing. Mr. Monkey and the Cruisers enjoyed this little dish. 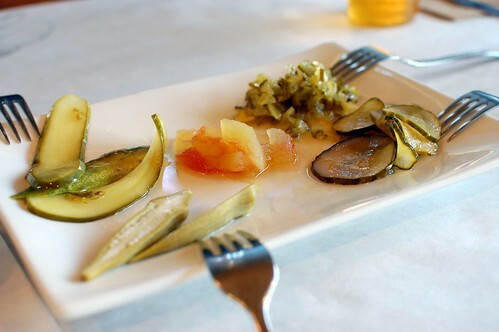 I had a small taste of each, but I can't say that I'm a big fan of pickles generally, so I'm not qualified to judge. 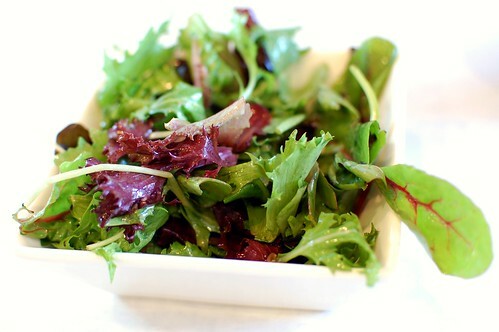 We thought some refreshing greens would be nice before we gorged on multiple meat patties, and they were. The dressing was light and had hints of vanilla. These were only ok to me. 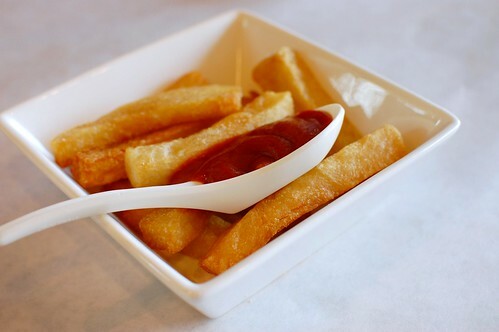 My first fry was quite enjoyable -- golden and crisp. In a matter of seconds, however, that feeling disappeared. Gobble these as fast as you can, or skip them altogether. They don't taste good unless they're piping hot. 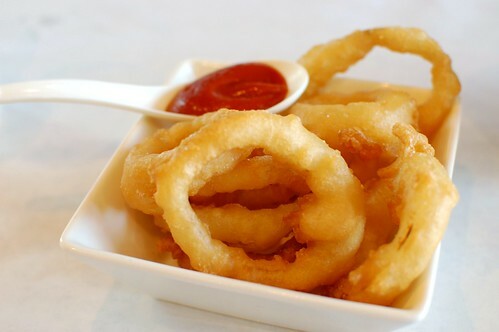 Malt liquor tempura onion rings ($2.50). These were slightly better than ok. Definitely superior to the fries, but I'm not sure I'd order them again. They, too, suffered from the instant-decline-in-tastiness-after-a-few-seconds syndrome. But enough with the sides! Bring on the burgers! 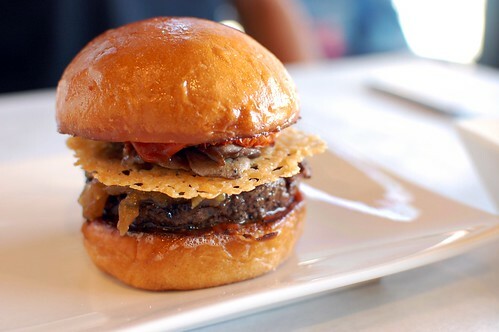 Umami Burger ($9): roasted tomatoes, grilled shiitake mushrooms, grilled onions, and a parmesan crisp. This was my fave of the day. I think it was the parmesan crisp that won me over. Super yummers to the max. Triple Pork Burger ($11): fresh ground pork, chorizo, and applewood smoked bacon with Manchego cheese and pimento aioli. I thought I was going to love this, but I didn't. I liked it. It wasn't as juicy as the beef burgers. My heart definitely still belongs to the pork burger at Wood Spoon. 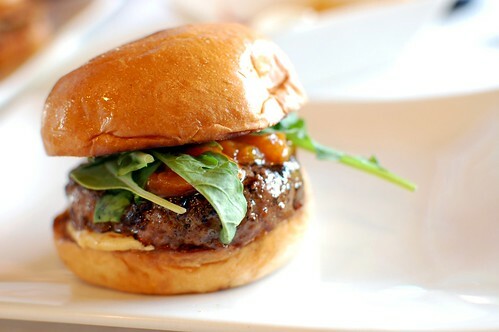 Casablanca Burger ($11): fresh-ground leg of lamb, Merguez lamb sausage, pickled apricots, arugula, and pomegranate aioli. I dug this, but I would've liked it more sans pickled apricots. They didn't do anything for me. Actually, they were kind of a weird distraction. 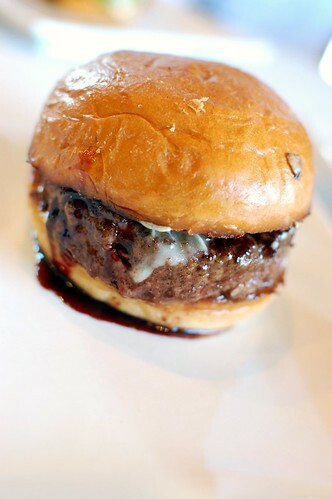 Port and Stilton Burger ($9): bleu cheese and Poças Port-caramelized onions. Very simple but enjoyable. If you like wine and strong cheese, this is the one for you. 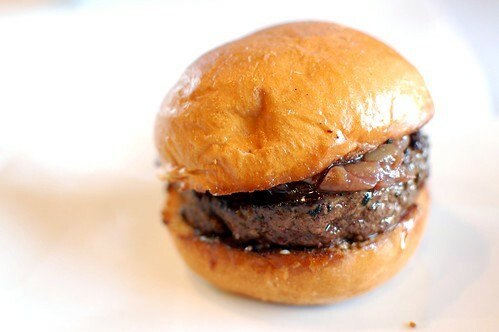 Truffle Burger ($11): Italian truffle cheese, truffle glaze. A bit disappointing. I was expecting a more distinct truffle flavor, but I just didn't taste it. 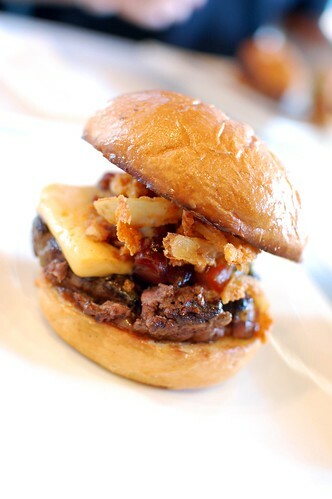 Manly Burger ($10): beer-cheddar cheese, smoked salt onion strings, bacon lardons. Sure to please any red-blooded American. Familiar and reliable accoutrements. You'd think that, after eating several sides and six burgers, we'd be ready to leave. Nope. We are animals, my friends. Rawr. Ice cream sandwiches ($4.50): pumpkin spice and coffee toffee. These were desserts from MILK. 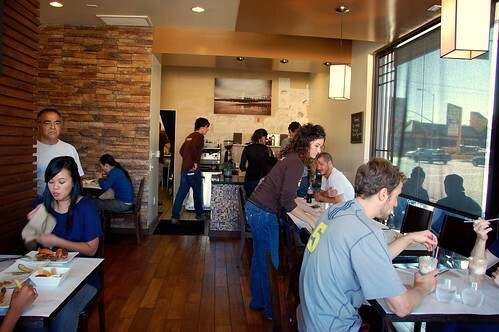 Umami also offers desserts from Cake Monkey. We've had the coffee toffee sandwich before. It was as good as we remembered. The pumpkin spice stole the show, though. I like pumpkin. I like spice. I like sandwich. It was nice. Yeah, Mr. Monkey really loves root beer. One last shot of the chalkboard saying of the day. Parmesan crisp in a burger? Sounds heavenly. The timing on this is too funny - at lunch yesterday my coworker and I had an entire discussion about finding and trying all the burgers here in San Diego. 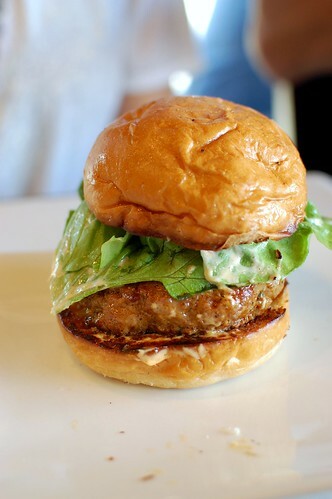 Why am I alone in my unappreciation of Umami Burgs? 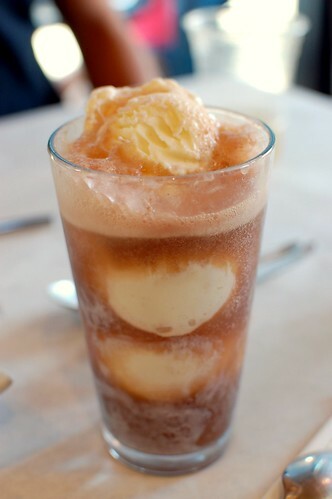 Am I missing the umami tastebud? Maybe I go to my Dr. to see about this potential life threatening sitch. You are not alone. sinosoul doesn't like Umami either. It's one reason it took me so long to get there. Looks delicious! I'm a burger face gansta so after reading this I'm definitely craving one. Apparently they're going to open up in the SaMo Fred Segal eventually, but in the meantime they're going to have a food truck permanently parked out front. Brent and I are simultaneously scared and excited. Hmmmmm I've been wanting to try Milk. It looks deeelish. I'm obsessing over what a salad dressing with hints of vanilla would taste like. sounds magical!! you had me at burger. and pumpkin. 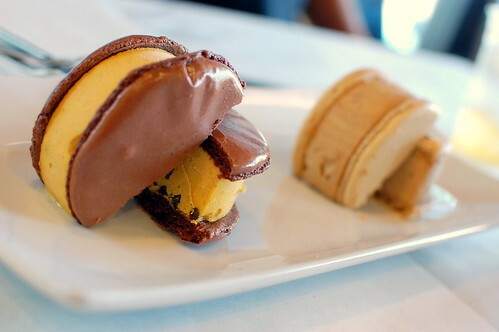 Is it wrong that I'm more excited by the ice cream sandwiches than the burgers? 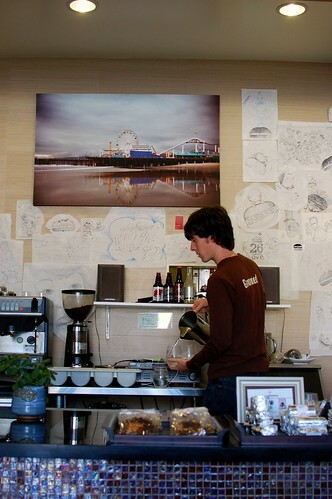 Your pictures make me hungry and miss LA all at once. 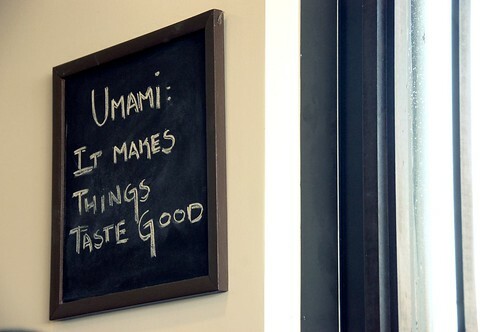 I need to get my @$$ to Umami! A shame about the lack of truffle essence. BYOTO? Bring Your Own Truffle Oil. I want that pumpkin spice ice cream sandwich!! A parmesan crisp? That is genius. I'd gladly pay you Tuesday for a hamburger today. LMAO insom! The burgers are cute. They seem a little pricey though, no? Unless they are bigger in person than they appear.